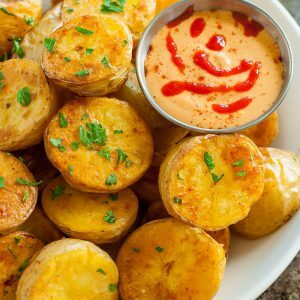 Super simple crispy roasted golden potatoes served with a tasty Sriracha pumpkin sauce, toss together Easy Oven Roasted Potatoes with Sriracha Pumpkin Aioli to compliment all your favorite Fall dishes! I’m totally THAT blogger today. The one that makes a super basic, ridiculously simple recipe, pairs it with a crazy sauce, and calls it a day. The one that combines pumpkin and Sriracha despite the most dramatic of eye-rolls from her husband. The one that dramatically dunks each crispy little bite in sauce, partially to annoy Mr. Judgey McJudgerson and partially because it’s flipping delicious! Ok so I know you could totally be making some ridiculously complicated recipe you found off Pinterest right now… but if you’re anything like me that’s literally the last thing you want to be doing. I don’t want to mold cake balls into perfect little turkeys and I certainly don’t want to spend my entire afternoon kneading pie crust, elaborately hand crimping it’s edges and topping it with hand-stamped acorn cutouts. No way. No how. Not happening. I’ve made exactly one from-scratch pie in my life and I now know that it’s MUCH better to simply have friends who bake. Except I just moved… and my baking buddies are a world’s away… and… will someone please adopt me and make me a pie!? Until a pie magically appears at my doorstep, let’s roast a giant tray of potatoes and call it a day, shall we? How glorious does that sound? You can pair them with my spicy pumpkin sauce or simply combine a fiery ratio of sriracha to ketchup and get your faceplant on. Better yet? Both. This super easy paleo side dish is great with everything! Scrub potatoes clean, then cut each in half. Toss in a bowl with olive oil, salt, and pepper and toss to coat. Spread potatoes out on a sheet pan in an even layer and roast for 40-60 minutes, flipping them over with tongs or a spatula at the halfway point for crispier potatoes. While the potatoes roast, whisk together your sauce in a small bowl. Toss fresh from the oven potatoes with parsley and dive in! For a Whole30 compliant sauce, swap out the Sriracha for your favorite hot sauce or try it with chipotle peppers in adobo - SO GOOD! FEELING FEISTY? Feel free to experiment with your seasoning combos! Sometimes I keep it simple with salt and pepper and other times I combine sea salt, garlic powder, onion powder, and cayenne pepper for a fun and flavorful twist! I told you it was easy! No need for a freezer stash of french fries when you have a bag of baby potatoes handy. They’re like a healthier version of steak fries with the crispy skin and buttery melt-in-your-face potato-y center. Pretend that makes sense. They’re SO GOOD! I heart them. The end. I promise next time I’ll have something super crazy creative up my sleeve. Today I’m sticking with simplicity and loving it. 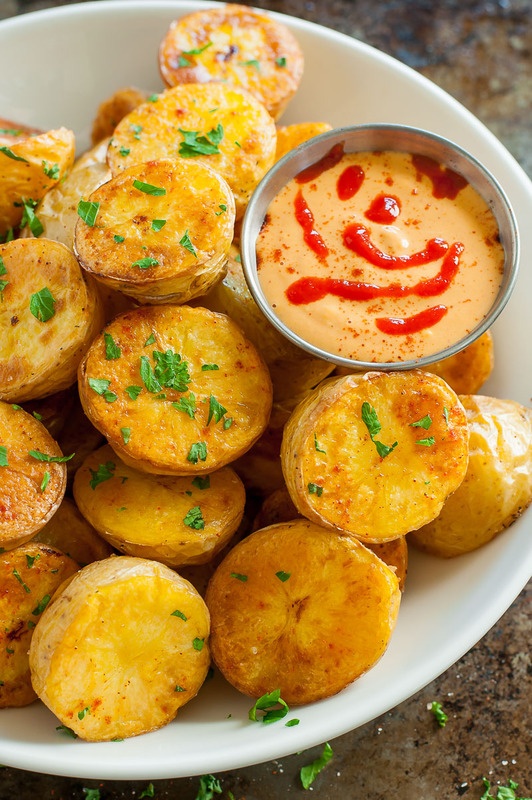 These potatoes look perfectly crisp and I know I’ll love the dipping sauce! Virtually guaranteed to be delicious! However, is it guaranteed to be very healthy? Various studies have found that high temperatures, i.e. above about 320 degrees Fahrenheit create various unhealthy substances, especially where meat is involved, but also starch and sugar. I’m going to try this recipe but will only heat the oven to the said 320 degrees and increase the cooking time a bit. Hi excited to try out the recipe.. Any substitute for pumpkin? Totally drooling over this creative perfection!! My latest obsession is thinly slicing sweet potatoes, tossing them in coconut oil + salt, and roasting them until crispy/almost burnt. Easy and tasty, though with how I’m plowing through them, I fear I could turn orange any day now! The pumpkin sriracha aioli sounds like a nice added touch! Yummy and I have all the ingredients at home. Pinning! Thanks Emily! Hope you adore it! Oh yes totally make it at home! Saves $$ and you can make it as spicy or mild as you like! I go WAY spicy! <3 Thanks Rebecca! *stands and claps* You know I’m all about easy recipes! Also, baking pies is for the birds. I *LOATHE* it. Especially when my FIL keeps it 107,000 degrees in the house at all times. That makes pie baking a disaster in our kitchen. I’ll never do it again! I could eat potatoes all day, every day. As a bonus I know how to make pies.